I arrived on the garage top bright and early this morning and immediately spotted one of the adults sitting on the Chicago Board of Trade annex, across the street. The other adult made a brief visit and I again saw a flash of red on the leg. The second bird was larger than the first, so I assume that’s the female. I hope it is Herc and Max again! The male allowed me to see the green on his band, but I couldn’t read the numbers. The quest for legband numbers is on again, I see! As I watched, he mostly preened his feathers, but at some point, he hopped over to a mass of feathers on the ledge that I’d identified as a Northern Flicker. He kind of picked at the flicker and then hopped back to the corner to preen again. It’s so very good to be out watching these guys again! As I left, I stopped by the garage office to say ‘hi’ to Nichelle. She was all smiles and hugs and we spent a few moments catching up. Sadly, she told me that James had retired in the winter. I’ll miss James a lot and hope that we run into one another again some time. Maybe he’ll come up to the garage top and watch the birds this year! Nichelle told me that Tom was still there, though and I’ll be watching for him now that I am going over more often. An update on the museum pair. Sadly, we haven’t seen them at all in the last few days, although a lot of people are watching the ledge. 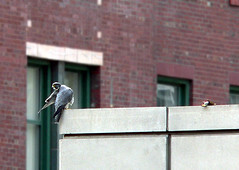 Mary thinks they may have decided on another nesting ledge somewhere else in the city. Sucko! We were both really looking forward to having peregines nesting right at the ole’ workplace! ~ by Steph on April 3, 2007.